Lucerne, Switzerland – January 20, 2018 – (GuitarPR) – Relish Brothers AG announced it has recently raised over $3 million to continue revolutionizing the electric guitar market. The Switzerland-based company has developed an innovative approach to electric guitar production that has resulted in 300% yearly sales growth along with production volume of over 1,000 Swiss-made guitars since their founding in 2013. The newly raised capital will be used to finance international expansion. Distribution partners in the USA, Japan and China are already lined up and more are expected follow. Relish Guitars will exhibit at NAMM 2018 in Anaheim, CA at booth #5435 as they launch their latest innovations, further revolutionizing the traditional electric guitar market. 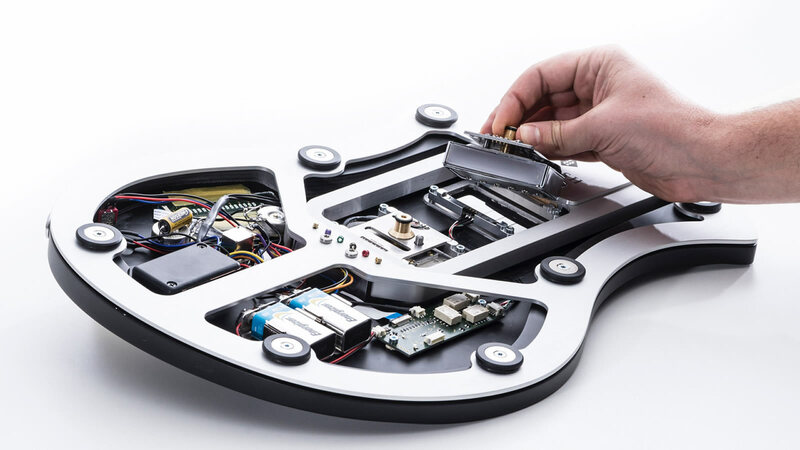 Their new sandwich construction design which combines aluminum and wood in a body that maximizes string vibration, sustain, and harmonic overtones. This results in a unique new sound experience with high-end output signals as an electric and/or acoustic guitar. A patented pickup swapping solution which lets players swap a pickup within seconds. This revolutionary development allows guitarists to install various pickup sets to modify their guitar sound organically. The same guitar can be set up for a hard rock output signal and within seconds be adapted for a jazz jam. Any pickup set in a standard humbucker format can be plugged into the guitar and immediately played. A touch control board on the guitar to select pickups, split the pickup coils, and mix the pickups in more than 15 different combinations. LED lights indicate the activated signal. The touch control allows for more mixing possibilities between the pickups than a standard mechanical toggle switch which typically has only 3 or 5 positions for guitar signal selection. All guitar signals are analog and passive for high-end guitar signal output. Further innovations such as sustainable bamboo, replacing traditional endangered tropical wood in the guitar, and bended necks that produce an “unbreakable neck” have been developed. Relish Guitars has entered a traditional market with a completely new electric guitar concept. Their guitars are priced between $2,500-$6,000 USD MAP. To compete in a global market, Relish has implemented a lean production system with one-piece-flow working stations in addition to investing in their new manufacturing facility located in Sempach Station, Switzerland. The Relish Guitars team of 4 employees together with the 2 founders delivered over 550 guitars to the market in 2017. The efficiency in building premium quality guitars, options for players to customize their guitar along with groundbreaking innovations have allowed Relish to successfully distribute their guitars worldwide. More information is available at http://relish.swiss.